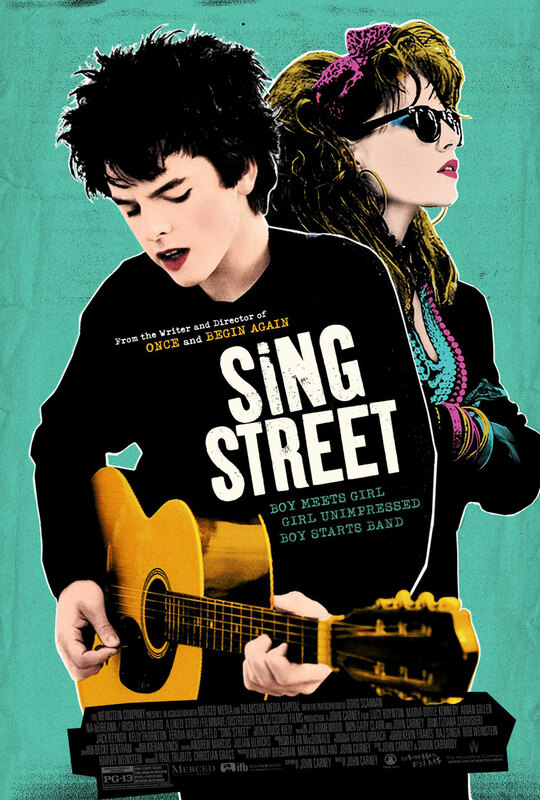 The feeling of watching Sing Street, the latest and for me greatest music-themed drama from director John Carney, is best described partway through the film. The moment comes when the troubled aspiring model Raphina (Lucy Boynton) talks to our lovestruck teenaged protagonist Conor (Ferdia Walsh-Peelo) about learning how to balance feelings of happiness and sadness. Being “happy-sad” is how she describes it, the ability to feel one emotion and convey another through song. You know, like The Cure. And what a happy, sad, joyous and bittersweet film this is, a 1980s coming of age gem and the rare crowdpleaser that resonates with deep feeling and a genuine undercurrent of poignancy. The setting is Dublin, Ireland in 1985, a time when things were far from hopeful for the country, with fallout from ongoing conflicts in the north still being felt. Dark clouds hang above, both literally and figuratively. With his family no longer able to afford a private education, Conor gets switched to the Synge Street Christian Brothers School, where the priests impose strict dress codes and rules upon their students, and the working class boys fall into camps of either being misfits or bullies. Enter Raphina, a slightly older girl who he sees standing across the street from the school, her cigarette and denim jacket making her seem like the epitome of teenage rebellion. Conor is instantly smitten, and impulsively invites her to be in a music video, which means that he has to put a band together in order to make it happen. Gathering up a ragtag group of students, and inspired by the success of Duran Duran, they take on the name Sing Street, and give themselves a crash course in writing their own songs and learning how to perform. Conor even starts wearing eyeliner and dressing flamboyantly, expressing himself by emulating the musicians that become his guide. The music provides a much needed escape for the boys in the band, who face a variety of social problems in their personal lives. Conor’s parents (Aidan Gillen and Maria Doyle Kennedy) are far from happily married, often engaged in fights that leave a bitter air of desperation around their home, as his sister Ann (Kelly Thornton) mostly keeps to herself, quietly studying in the background. His older brother Brendan (Jack Reynor), the most outspoken member of the family who lives out his own dashed dreams in a cloud of pot smoke, happily takes on the role of mentor to Conor, giving him “homework” from his extensive record collection to help expand his musical influences. John Carney has already proven adept at exploring characters who find refuge from their broken lives through creating and performing music, both in his breakout romantic hit Once and the underrated dramedy Begin Again. But Sing Street might just be the best example yet of his gift for blending music and character drama. With a partially autobiographical story, this is a culmination of his talents that mixes together everything that worked so well about his other films, to provide an incredible showcase for every single one of his strengths as both a storyteller and songwriter. The film finds grit through the way it captures the working class struggles and political unrest that was felt throughout Ireland at the time, leaving many dreaming of crossing the ocean to find a better life in London. The film captures the feeling of wanting to escape and yearning for more than what you’ve got, even if your dreams can only be achieved for a few fleeting moments through song, like in one fantastical 1950s dance sequence that leaves us smiling behind tears. Because of this, Sing Street is powerfully able to understand just how much the music comes to mean for its characters. The soundtrack offers an excellent selection of 1980s hits from bands like Duran Duran and The Cure, and the original songs fit in just well alongside these classics. When these kids start rocking out, they’re actually really good, and tracks like the upbeat “Drive It Like You Stole It” and the quiet ballad “To Find You” would play just as well on the radio. The songs are heavily influenced by the pop sounds of the time, and their first music video for “The Riddle of the Model” is even shot on an old camcorder, which evokes instant nostalgia. A climactic performance of the protest anthem “Brown Shoes” is so rousing that I’ll be shocked if audiences aren’t tempted to be on their feet right alongside the characters. The entire cast does top-notch work. With a background in music, Ferdia Walsh-Peelo owns the screen like a true star, delivering one of the most promising and assured acting debuts in recent memory, quietly emotive and coming out of his shell over the course of the film. Jack Reynor continues to prove himself as one of our finest up and coming actors, with a knockout supporting role that is an equally memorable part of the film’s success. A stunning and deeply moving scene between the two brothers, where Brendan lays bare the path he has carved out for Conor, rings with the authenticity of a close sibling relationship, brilliantly acted on both their parts and filled with astutely observed dialogue. The film is equally compelling in the musical set pieces as it is in the quiet character-driven scenes, like when the whole family watches the music video for Duran Duran’s “Rio” on MTV, a moment of revelation for Conor that seems completely lost on his parents. The screenplay is filled with wise and beautifully written observations of its characters, as insightful about real life as it is wistful about following your dreams, perfectly capturing the feeling of being a teenager who wants to rebel against the system to find their own place in the world. There are few films better at evoking these sorts of feeling. This is a film that works exceedingly well as a crowdpleaser, taking us through a range of emotions and ending on a profoundly bittersweet note. It’s a sweetly nostalgic film that will plaster a smile on your face and also make you well up with tears, all set to a terrific soundtrack. Put simply, Sing Street is as close to perfect as they get. Sing Street is now playing in limited release at the Varsity in Toronto, and will be expanding to more theatres across Canada in the coming weeks, so keep checking your local listings.